SAN DIEGO – Oct. 3, 2018 – On the evening of Saturday, Sept. 29, 2018 the GI Film Festival San Diego announced the winners of this year’s festival. More than 120 people attended the soiree hosted by comedian and former U.S. Navy Officer, Jamie Kaler, with featured entertainment by the American Flyboys. This year’s military film festival, which is the largest on the West Coast, featured 34 films, 15 screenings, and countless opportunities to be inspired. The six-day festival was also home base for the national GI Film Festival in 2018. The awards program recognized the courageous storytelling produced by international, national and local filmmakers. Some of the nominated films qualify for both national and local awards, as content features San Diego events, people, places, and filmmakers. The world premiere of the four-minute narrative short “Let It Go,” directed by San Diego filmmaker Stephanie Heim, was the runaway winner of the evening, earning three awards in both national and local categories: Best Film Made By or Starring Veterans or Military, Local Film Showcase – Best Actress, and Local Film Showcase – Best Narrative Short. 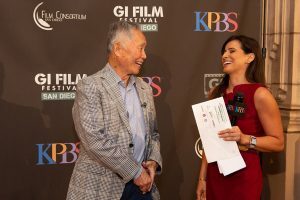 The 2019 GI Film Festival San Diego is scheduled for September 2019. For up-to-date information on the festival and to be notified of the film submission process for 2019, visit www.GIFilmFestivalSD.org. Established in 2015, the GI Film Festival San Diego aims to honor and preserve military stories. The films reveal the struggles, triumphs, and experiences of service members and veterans through compelling and authentic storytelling. Documentaries, shorts, narratives, and family-friendly films are presented, highlighting stories of heroism, resilience, and honor. The festival also includes the Local Film Showcase, which features San Diego’s filmmakers, events, people, or places. Panel discussions with filmmakers, actors, and documentary subjects are also part of GI Film Festival San Diego. The festival also includes a family movie night, bringing military-connected and civilian families together for an evening of movie magic and community spirit. The festival is organized by KPBS in partnership with the GI Film Group and Film Consortium San Diego. Official sponsors of the 2018 GI Film Festival San Diego include: Kaminskiy Design & Remodeling, The Super Dentists, TriWest Healthcare Alliance, BAE Systems, Lewis University, National City Mile of Cars, the San Diego Opera, Altus Schools, Bob Baker Subaru, and Miramar National Cemetery. Additional support is provided by Scatena Daniels Communications. The GI Film Festival San Diego is a proud member of the San Diego Veterans Coalition. KPBS serves San Diego and Imperial counties with trusted news and programs that inspire, respect and educate. KPBS delivers this content to more than one million audience members weekly via multiple outlets, including television, radio, and digital media. As a public service of San Diego State University, education is a core value – from our children’s programming to our local news coverage. KPBS is committed to being a reliable source for in-depth, thoughtful, and high quality content. For more information, visit kpbs.org.